The London Mathematical Society is the major UK learned society for mathematics. The Society's activities include publishing journals and books, providing grants to support mathematics and organising scientific meetings and lectures. Compositio Mathematica is a prestigious, well-established journal publishing first-class research papers that traditionally focus on the mainstream of pure mathematics. Compositio Mathematica has a broad scope which includes the fields of algebra, number theory, topology, algebraic and differential geometry and (geometric) analysis. Papers on other topics are welcome if they are of broad interest. All contributions are required to meet high standards of quality and originality. The Journal has an international editorial board reflected in the journal content. Online access is free for all papers published 5 years ago or more. Papers published before 1997 are available from the NUMDAM website. 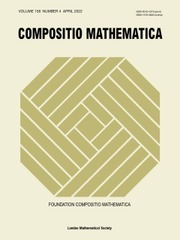 Compositio is owned and published by non-profit organisations (the Foundation Compositio Mathematica and the London Mathematical Society) that use any surplus income from journal subscriptions to sponsor mathematics and mathematical research. Mathematika publishes both pure and applied mathematical articles and has done so continuously since its founding by Harold Davenport in the 1950s. The traditional emphasis has been towards the purer side of mathematics but applied mathematics and articles addressing both aspects are equally welcome. The journal is published by the London Mathematical Society, on behalf of its owner University College London, and will continue to publish research papers of the highest mathematical quality. 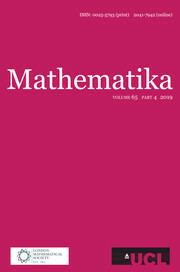 Since 2011 all current subscribers have had online access to the complete Mathematika archive back to issue 1. 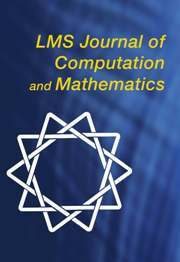 LMS Journal of Computation and Mathematics is an electronic-only resource that publishes papers on the computational aspects of mathematics, mathematical aspects of computation, and papers in mathematics which benefit from being published electronically. Rapid times to publication ensures that readers are kept abreast of ground-breaking developments fast and, while the main text of each paper is guaranteed to remain unaltered, the journal's format enables users to add updates and discussions to papers encouraging more interactivity. Hyperlinks are also provided for cross-references within and between papers. The journal is refereed to the same high standard as the established LMS journals, and carries a commitment from the LMS to keep it archived into the indefinite future. Access is free until further notice. Click here for further details.